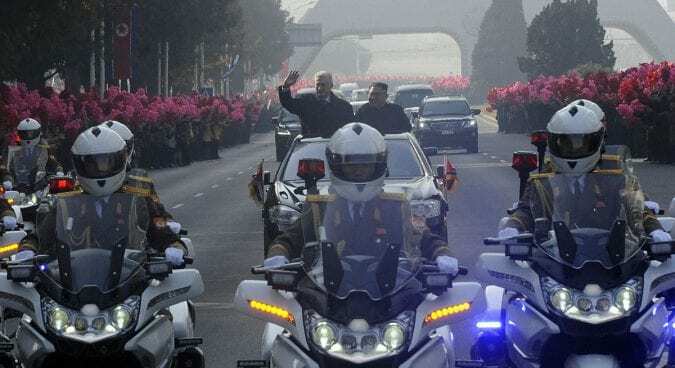 Cuban President Miguel Díaz-Canel arrived in Pyongyang on Sunday for the first state visit by a Cuban leader to North Korea in over thirty years, joining the country’s leader Kim Jong Un in condemning the “imperialists’ policy of aggression,” DPRK state media reported on Monday. 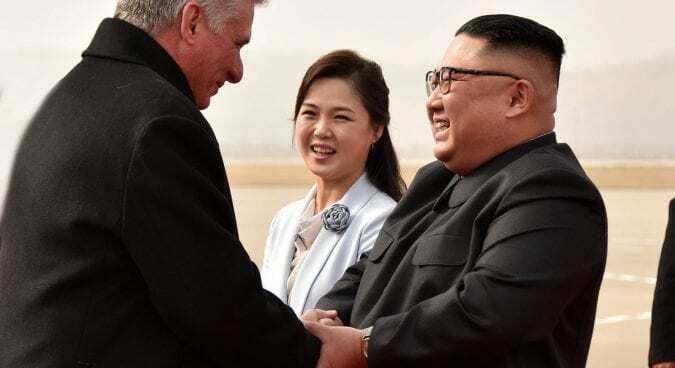 Kim greeted Díaz-Canel at Pyongyang International Airport with a ceremonial welcome, which included a surprising backdrop of painted portraits of the two leaders – a first for the Kim Jong Un era. The meeting represents Kim’s eighth summit with a foreign head of state this year. The two then held an official meeting, attended an arts performance, and held a dinner banquet, where there were discussions over expanding scientific and economic cooperation and reaffirming historic ties, according to the Korean Central News Agency (KCNA). Díaz-Canel also echoed recent statements from Kim and elsewhere in DPRK state media alluding to the struggle against the U.S. and others amid ongoing denuclearization negotiations. “Today the Cuban people hold higher the banner of anti-imperialist independence and socialism in the face of tough sanctions and pressure by the imperialists under the guidance of Raul Castro Ruz and Miguel Mario Diaz-Canel Bermudez true to the behests of Fidel Castro Ruz,” it added. U.S. National Security Advisor John Bolton last Friday said the Trump administration was tightening sanctions, closing loopholes, and was poised to impose new designations on dozens of Cuban military and intelligence individuals, describing Havana as being part of a “Troika of Tyranny” alongside Venezuela and Nicaragua. The two also reportedly discussed during talks at the Paekhwawon State Guest House “exchanges in various fields including economy, culture, public health, science and technology to meet common interests,” KCNA reported on Monday. During the first day of Díaz-Canel’s visit, the Cuban President was treated to crowds of Pyongyang citizens mobilized to line the streets to wave at the passing motorcade on the way into town from the airport – similar to those most recently seen during South Korean President Moon Jae-in’s visit in September. Kim and Díaz-Canel also attended an arts performance featuring the Samjiyon Orchestra and the reappearance of the Moranbong Electronic Ensemble, where Cuban songs and other odes to socialism were played. The visit marks the first from a Cuban leader to North Korea since Fidel Castro’s 1986 trip to Pyongyang, and comes almost 60 years after veteran revolutionary Ché Guevara traveled there in 1960. 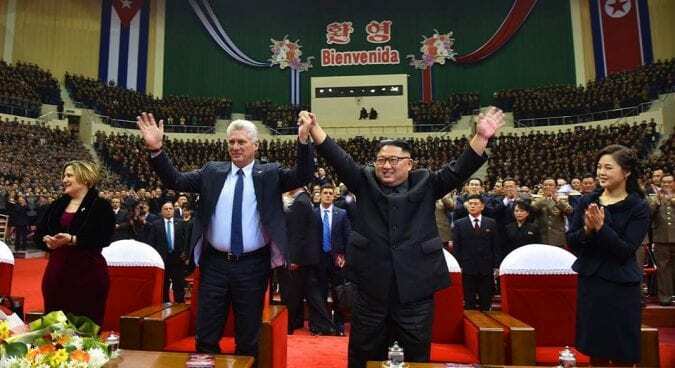 Díaz-Canel has visited North Korea before, however, having traveled to Pyongyang and met Kim Jong Un in his capacity as Cuban Vice President back in 2015. No North Korean leader has ever visited Havana. Díaz-Canel is also set to also meet with President of the Presidium of the Supreme People’s Assembly Kim Yong Nam, according to Cuba’s foreign ministry. He will depart Pyongyang on Tuesday on his way towards China, Vietnam, and Laos.